Do you find project management stressful? Do you struggle to keep your tasks, team members, and goals organized? How to use Trello effectively? How to use Trello for project management? 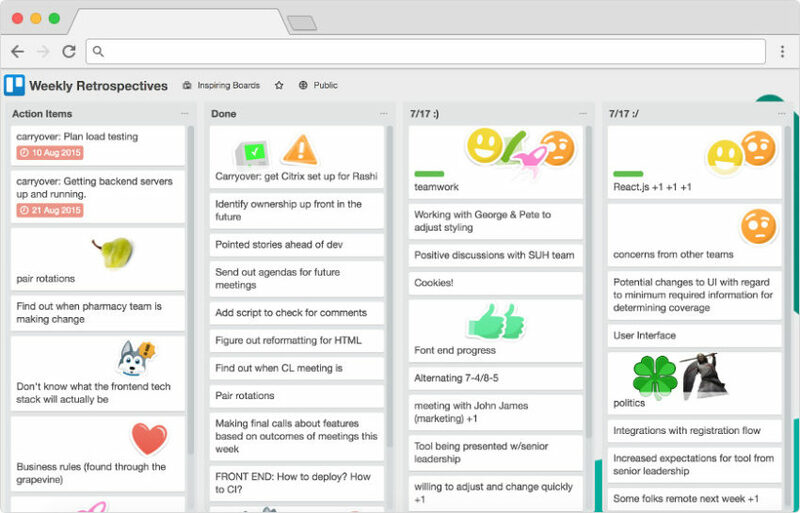 Trello is, at its core, an online corkboard. You use it to organize “cards” into lists—those cards can be tasks, notes, projects, shared files, or anything else that helps your team work together. It’s based on a simple idea: for effective project management, you need full visibility over all relevant tasks and flexibility to rearrange them as your priorities change. 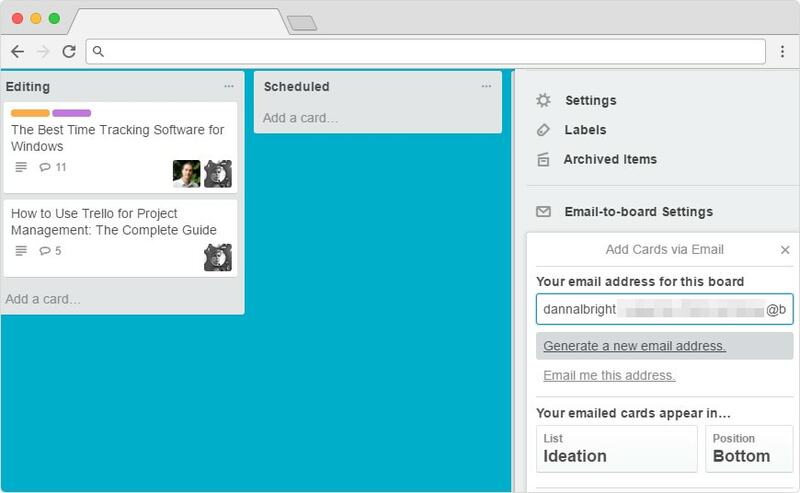 Equipped with a Trello board, you can create order in your work by organizing it into lists of cards. Then you can quickly adapt it to any new circumstances by rearranging them. Which is exactly why it’s so great for project management. Trello is a great tool to replace your team’s use of email and chat for task-based communication. You can learn all you need to get a job done from a task card, and all discussions about it can take place right there. By keeping all of the information you need in a single location, it’s easy to keep everything on track, quickly see what’s being done, and look back to previous conversations. Trello is a phenomenal project management tool, whether you need to organize the work of a whole team or just want to boost your own productivity. If you have to handle a team workflow, you can use it in any area of your business, from software development and UX testing to marketing and design. The tool is also location-agnostic: it doesn’t matter if your teammates are at the next desk or across the world. Trello will do the job. You can employ Trello to follow your production workflow. Manage your development schedule. Keep an eye on a content marketing campaign. Organize upcoming projects. Track the hiring and onboarding process at your company. Your dedicated board will show you what needs to be done, the status of all tasks, and where potential bottlenecks are, no matter what you’re using the board for. 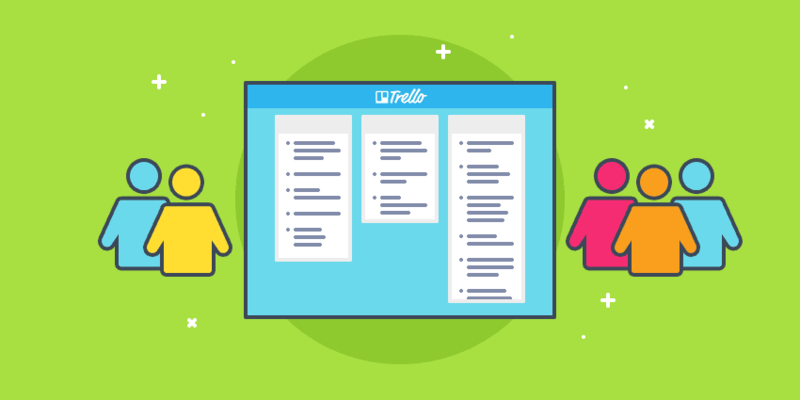 Since Trello is well-suited for agile methods, it’s a great place to keep your Scrum board. You can also apply the Kanban methodology and run a Kanban workflow with Trello. It’s great for prioritizing urgent and important tasks. It works for time blocking. In fact, it can be used for pretty much any productivity or time management strategy. At Hubstaff, we organize our editorial calendar in a Trello board. It keeps everyone involved in the editorial process on the same page. I can see which writers are working on which projects, what needs to be edited, which articles have been scheduled, and what’s already been published. It’s the only place I need to go to see the status of our editorial process. Why is Trello so practical for managing projects and processes? It’s all about structure. The app’s design stores a lot of information in a highly organized, clean space. Its simplicity belies a huge amount of power. Before we delve in the details of Trello project management, let’s take a quick look at the basic units you’ll be working with. 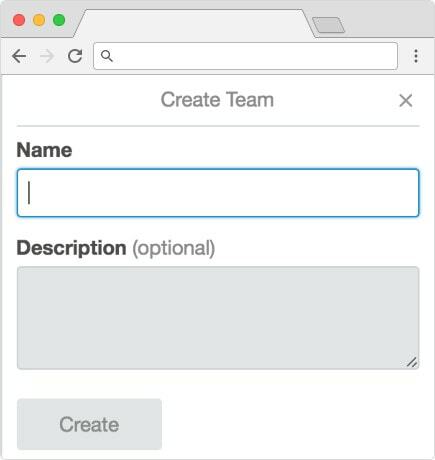 When you open a Trello account, you get to create the first unit of your work: a Team. You can have many Team spaces. The best thing about cards is that they allow people to talk about the task at hand. You can mention team members in a comment by typing “@” and their username. Then all pertinent communication stays with the task, and anybody can pick up the work from there. 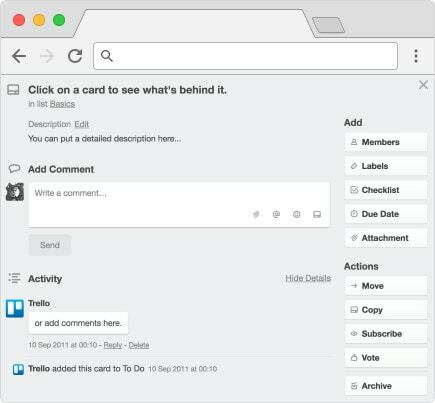 PRO TIP: You can add tasks straight from your email to a Trello board. Just go to a board and click on Email-to-board Settings on the right side menu. Make a note of the email address. When you send an email to that address, the subject line will become the card title, the body will be the card description, and any attachments will be attached to the card. For more tips on this process, check out the Trello tutorial. Wonder how you stay up-to-date with tasks without email? Trello has it covered. Notifications inform you about news from the boards and tasks you’re a member of, so you’ll never miss an important development or question. You can tweak your notification settings in your account settings, which are accessed by clicking on your name and picture. 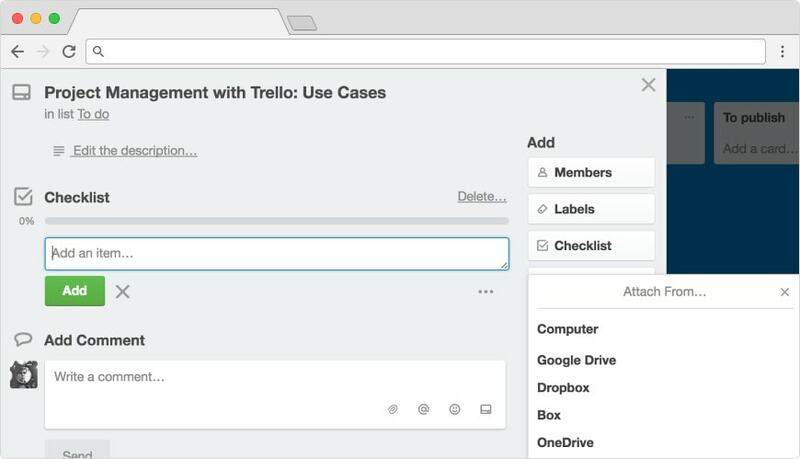 You can use Trello’s power-ups to connect applications like Slack, Github, and Intercom straight to your cards. You can even connect Hubstaff to keep track of the time your team spends working on specific cards! The list of power-ups is long, which guarantees that Trello will easily integrate into your workflow. 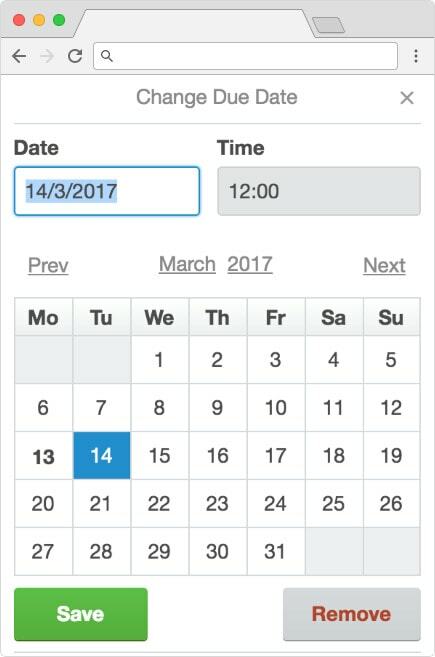 Trello also integrates with Hubstaff’s time tracking software. 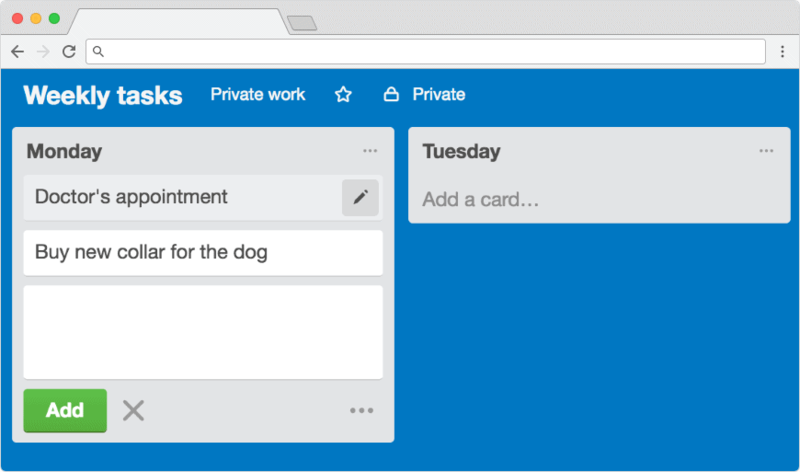 With their chrome extension, you can track time on cards within Trello’s dashboard itself. Pretty cool, right? Here are step-by-step instructions to set up Trello’s time tracking integration with Hubstaff. Let’s take a look at Trello in action. 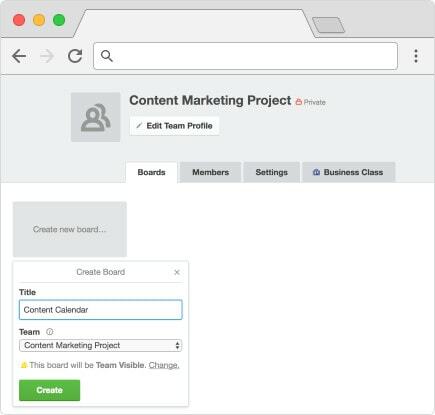 Here’s an example of how you can employ Trello to start managing a content marketing project with your team. Name the team space according to your project’s title and include a description if needed. Create a new board for each stream of activity within the project. In this example, we’ll create a board to manage the content calendar for the content marketing project. 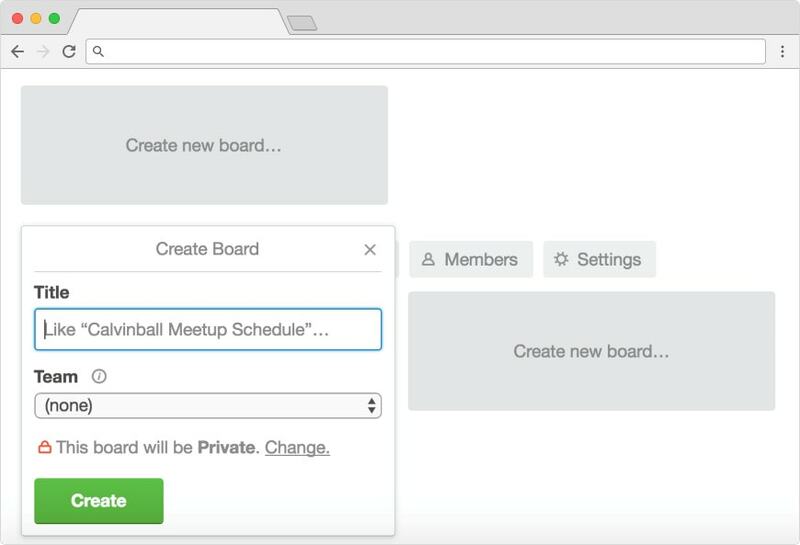 Invite the rest of your team members to the team space and boards that are relevant for them. 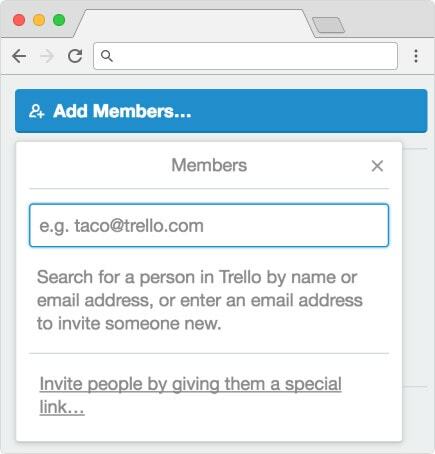 You can add people who are already on Trello or send an email invitation with a Trello signup link. On the board, create lists to correspond to the stages of content creation. You can start with To do and continue with Writing, Editing, Visuals, To publish, and Published. 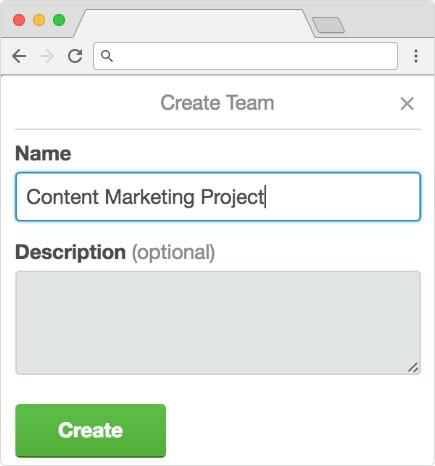 Each task card will need to move through every list in during the content marketing process. One card represents one task. Input all the relevant tasks you have at hand and place them in the relevant list. This gives you a full overview of your team’s work. Distribute tasks to different assignees by adding team members to the card. You can also mention people in the comments by typing “@” and their username. Add a due date and time to each card to make sure you’ll never miss a deadline. The beauty of Trello cards is that they contain all relevant information about a task. Enter a description, add a checklist with subtasks, and attach all needed files. This makes task handoffs between team members smoother. Use Hubstaff to track time spent on each task within Trello. You’ll see where your team is spending time so you can better estimate how long tasks take, where project bottlenecks are, and how you can further improve your project management. Trello project management is suitable for staying on top of your personal and family projects, too. 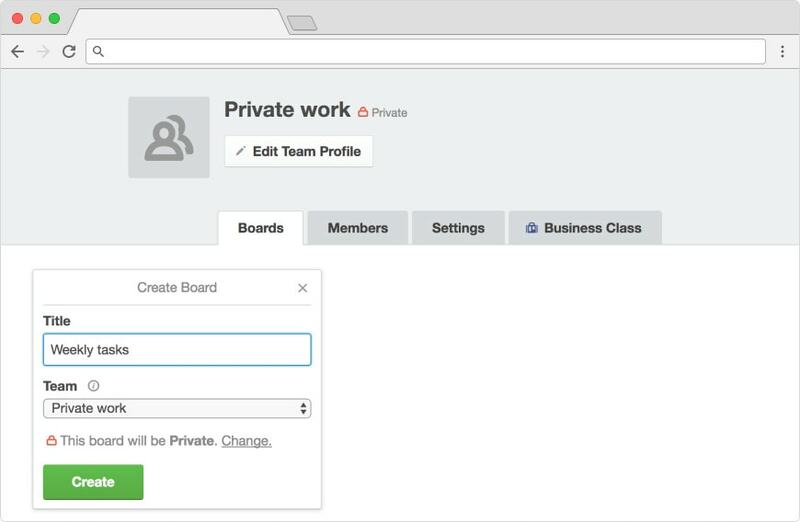 You can organize your own tasks in private boards and invite friends or family members to share information. By managing tasks in various areas of your life with Trello, you can create a single place to see what you need to do, no matter whether you’re at work or at home. Let’s illustrate how to use Trello for personal task management step by step. You can break down the different areas of your personal activities into boards that are nested in a private workspace. Add all your pending tasks in separate cards. Include relevant information like document attachments, task descriptions, due dates, and subtasks. You can also leave comments as needed. Development teams aren’t the only ones who can use sprints. Do you have a goal to achieve? Create a Trello board and jot down all the tasks you need to complete. Create lists that identify the different stages of completion and set time limits for moving each task through the lists. Then define a deadline for your whole sprint and watch yourself storm through tasks in no time. Modern businesses have a lot of projects going on at once. You have market research. Product development. Content marketing. Social media. Customer support. Growth planning. All of these projects need ongoing management. And having the right tool makes everything a lot easier. One of the things we love most about Trello project management is just how flexible it is. You can use it for any type of project you want, whether by yourself or with a huge team. It works with any type of organizational system. It doesn’t force you into specific patterns of planning or communication. It’s a low-friction way to get everything organized. And it’s really easy to learn and use. In short, it has all the characteristics of an awesome project management tool. Plus we can track the time that we spend on specific cards. It doesn’t get much better than that. 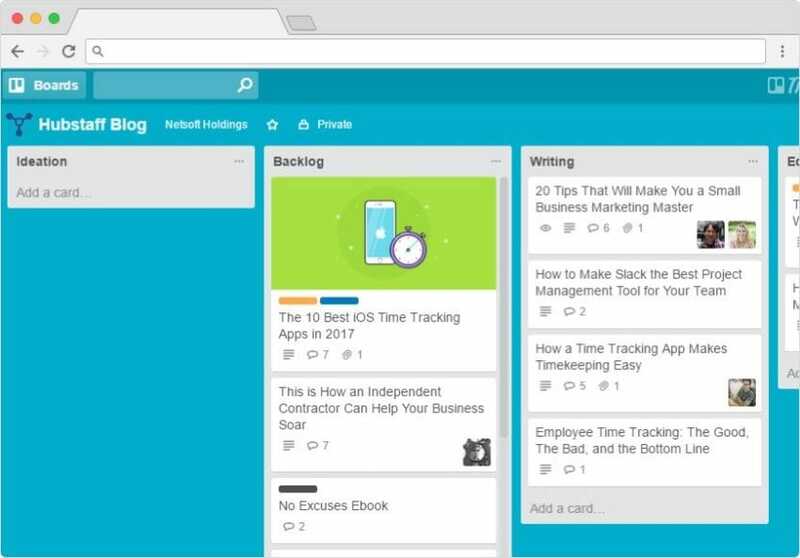 If you haven’t tried Trello before, it’s time to give it a go. You’ll be a project management prodigy in no time at all. Do you use Trello for project management? What do you like or dislike about it? Share your thoughts and your best tips in the comments below!